Backyard gardeners are used to brushing against leaves while picking corn, but few will experience the pain that a chance encounter with a caterpillar caused Jeanine Smetana, a Master Gardener in Harford County. “While I was picking corn in our garden two Sundays ago, I felt a few scrapes of the serrated edge of the corn leaves, or so I thought,” Jeanine wrote. “Monday morning I awoke with some serious heat and stinging pain in my face. When I looked at the left side of my face in the mirror, it was swollen, red, and kind of bumpy under my left eye and in the area of the ‘laugh crease’ from my nose down to my chin. “I scrubbed thoroughly, put on hydrocortisone as a precaution, and went about my business. My face got worse and progressively more painful. Nothing seemed to work. The harder I tried, the redder and more painful it became. So on Tuesday I called a farmer friend who suggested that my swollen face might have been caused by brushing against a saddleback caterpillar while I was picking the corn,” Jeanine continued. “The saddleback is one of a few venomous caterpillars–yep, venom, as in poisonous snakes. Saddlebacks have teeny-tiny, venom-filled spines on their back, also called ‘urticating hairs,’ from which they release venom when they feel threatened. Sometimes the entire spine comes free and embeds itself—just my luck! Most of the venomous caterpillars feed on deciduous plants including trees, but several websites indicate that the saddleback is frequently found on corn crops. “If you realize it when it happens, the tiny spines are quite easy to remove by pressing little strips of fresh Scotch tape across the affected area to pull the little barbs out. The quicker you get the spines out, the less venom that goes in. Since mine had been there for a couple of days, I began to look like Quasimodo. Nevertheless, the Scotch tape did remove the hairs, which eased the pain. After a trip to the dermatologist for a stronger topical steroid, my face is losing the redness and distortion. “These critters can be anywhere, on any plant. It’s surprising we don’t have more issues with them. Someone described the sting as ‘comparable to that of a manta ray.’ I believe it. Of course, the amount of pain does vary depending on factors like susceptibility and length of contact. Gardeners need to be aware of stinging caterpillars so they will know how to respond if they are ever stung. Jeanine highly recommends that you read an article, “Stinging Caterpillars Out in Summer and Fall,” by Stanton Gill of the University of Maryland Extension. “It’s like a bad science-fiction novel, ‘The Attack of the Scary Caterpillars,’ she wrote. “They even look freaky.” To read the article, CLICK HERE. 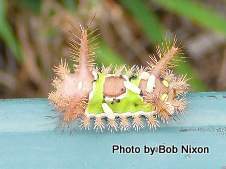 This stinging caterpillar is the larvae of the Saddleback Caterpillar Moth (Sibine stimulea). To see photos of the dark-brown adults on the Maryland Moths website, CLICK HERE. If you want to see a stunning collection of photos of venomous caterpillars, CLICK HERE to read “Stinging Caterpillars of the United States” at The Ark in Space website. 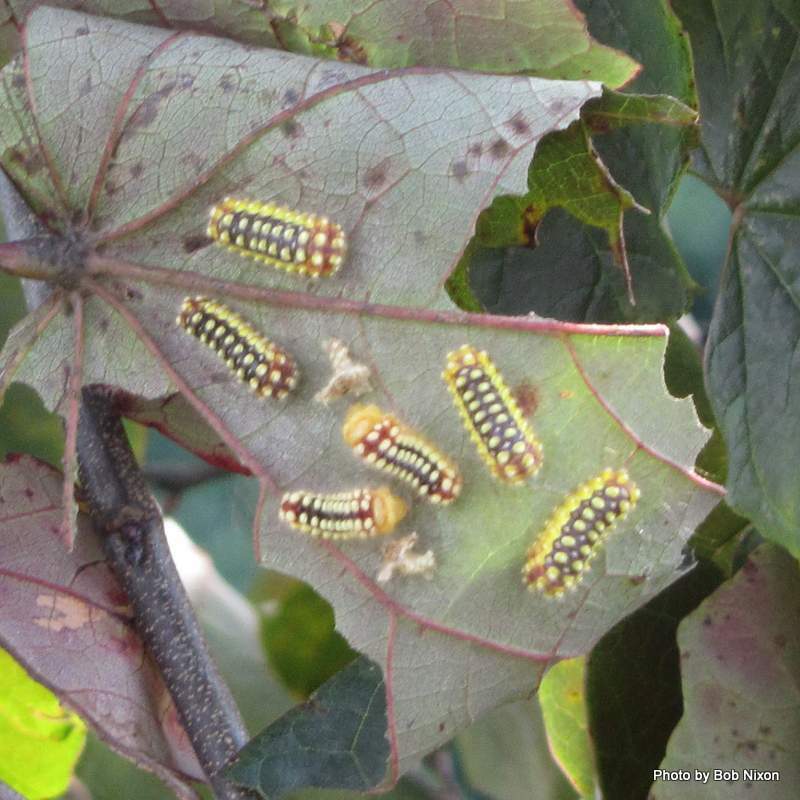 Jeanine wrote about her chance painful chance encounter after reading my recent personal blog about stings I got from white-flannel moth caterpillars on our backyard redbud tree. To read that posting, CLICK HERE. That is a very odd looking creature. I'll be sure to stay away from it!